Altar Server Ministry offers the youth of our Parish from Grade 3 on up, the opportunity to assist the priest and serve in a special way during the celebration of the Mass. Altar Servers are required to attend training sessions. They will normally be scheduled to serve once a month. If you are interested in this ministry, contact the coordinator, Al Garayalde – 431-2231 or call the Parish Office – 433-5536. Eucharistic Ministers assist the presider in sharing the Eucharist at Mass with reverence and dignity. Open to active, confirmed parishioners. Training is provided as needed. 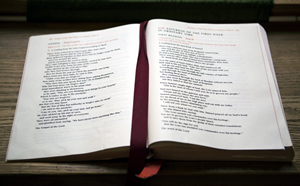 Lectors are men and women who proclaim the word of God to the assembly at Sunday and Holy Day liturgies. Training is required. 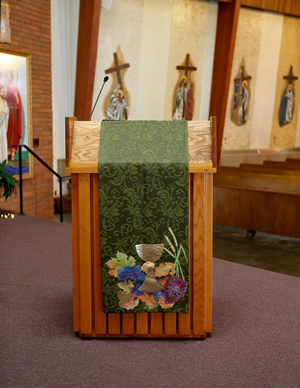 Parishioners who desire to become part of this ministry are invited to contact the Parish Office – 433-5536. The Greeter serves as an extension of the Community. A Greeter welcomes all those who come to share in our Liturgy celebration. As Greeters we must provide a strong sense of personal touch to make everybody feel welcome. A friendly smile and a few welcoming words greatly bless us all. Greeters are member of our parish which we consider the frontline of hospitality for St. John the Baptist Catholic Church. Greeters are the people who have the first initial encounters with visitors and play a unique and important role in establishing the spirit of welcoming which is experienced and conveyed by all the member of our Church. If you are interested in becoming a Greeter, contact Pat Flanagan – 433-3314 or the Parish Office – 433-5536.